The Book deals extensively with the different types of sculptures and portraits found in various temples and elsewhere and how they found important places in monuments and temples. 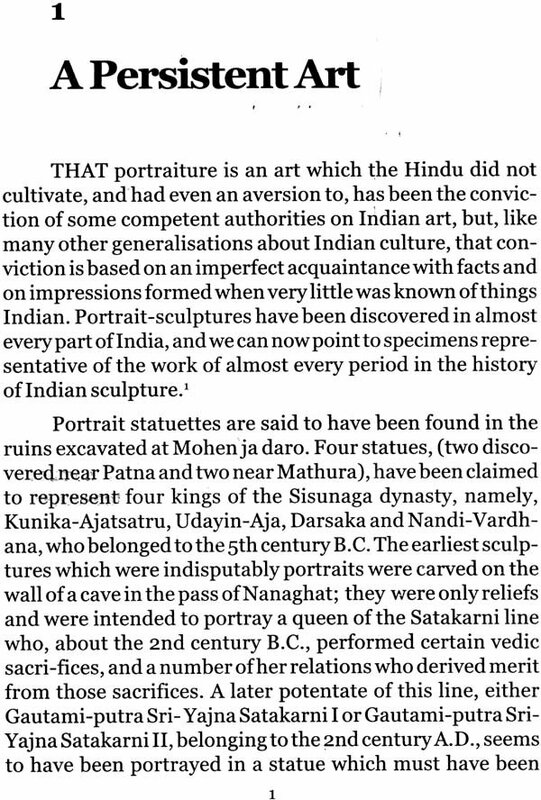 Portrait-sculptures have been discovered in almost every part of India, and we can now point to specimens representative of the work of almost every period in the history of Indian sculpture. Nowhere in India, however has the art had so persistent a life as in South India or such a creditable record of achievement, and nowhere else has the art drawn its inspiration more freely from the fondest beliefs and the clearest convictions of the people. 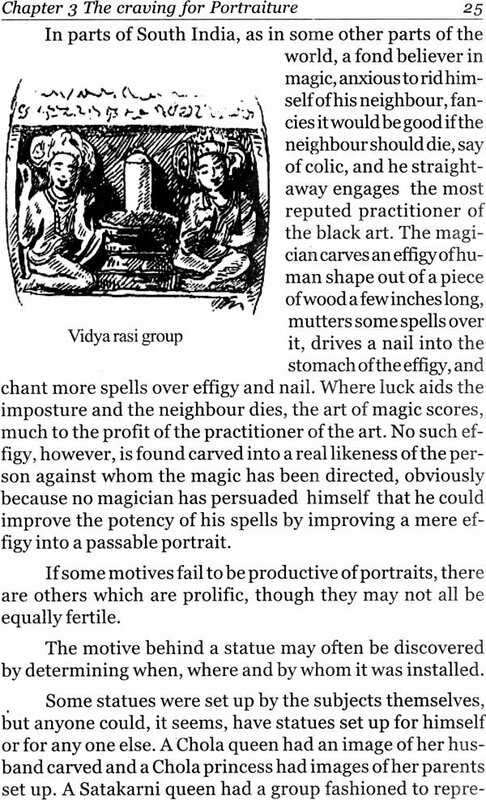 The south Indian sculptor was not a flunkey devoting his talents to the immortalizing of the facial lineament of the rich and the powerful; his chisel was very frequently employed in carving the features of those who, though lowly, were yet endowed richly with the rare virtue of faith. 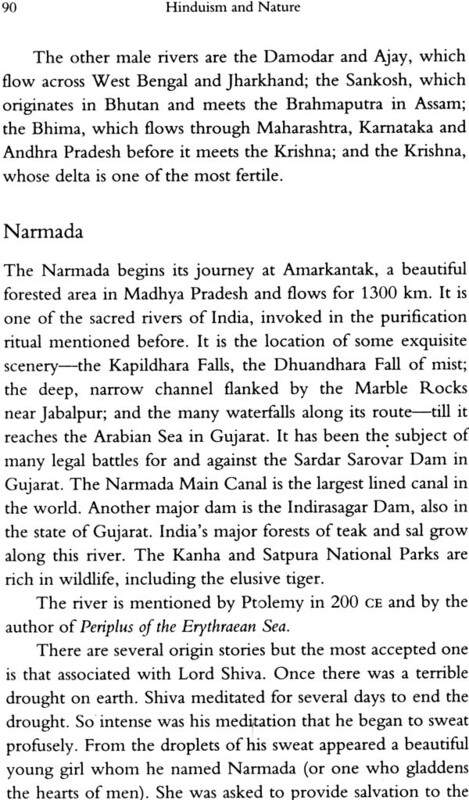 Literary works in the various languages of India do not generally allude to this class of sculptures. 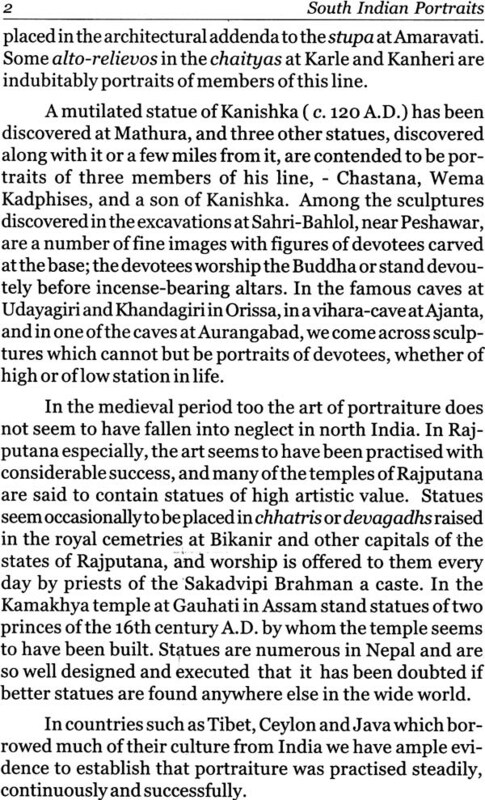 A few references in Sanskrit literature are utilised later in discussing the evolution of portrait sculpture. The earliest Tamil literature now available contains indications of the popularity of sculptures portraying human beings. Fully illustrated with samples from various sources this book will be an important contribution to the art and history of south Indian Archeology and Iconography. BECOMING interested in the subject of this book in 1921, I pursued my inquiries for some years, and about the middle of 1925, I wrote a short book embodying the results of my studies. A well-known journal devoted to Art undertook to publish the work in its pages, but in 1927 it abandoned the project all of a sudden, though the matter had been in type for months. In December 1927 my friend Mr. K Rama- kotisvara Rao, started publishing the work in instalments in his excellent journal, the Triveni. "When three instalments had appeared, the India Society, London, kindly agreed in April 1928 to bring the work out as one of its publications, and, thereupon the publication of the work in the Triveni was stopped. 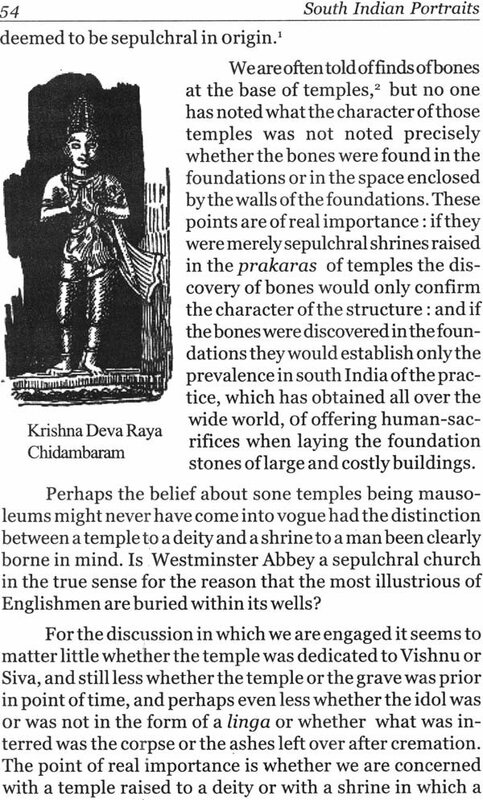 Later, the India Society decided to publish only the earlier chapters of the work: those chapters are now in the press and will be shortly published under the title, Portrait Sculpture in South India. The later chapters have gone into the present book, and as they form the sequel to the earlier chapters, this book is the complement to the book which is being published by the India Society. With the view, however, of ensuring a complete presentation of the subject in the present book I wrote two brief chapters for it, Chapters I and V, into which I compressed the data which are set out in full detail in the other book: the summary is bald and meagre, but in fairness to the India Society, I could not make it fuller. 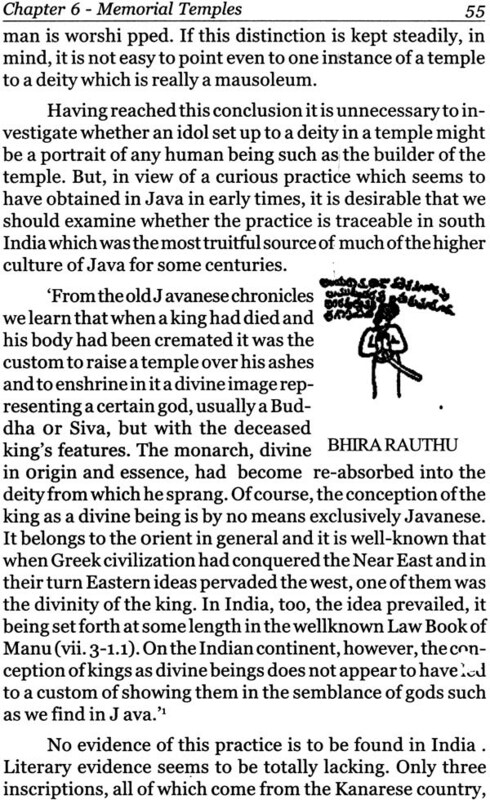 The book thus evolved was published serially between June and August of this year in the Hindu Illustrated Weekly, Madras, and I am now republishing it in this form with the kind permission of the proprietors of that journal. I have slightly recast the matter in some places, but I am afraid I might have succeeded only in adding obscurity to obscurity. No pains have been spared to make this book as distinct as may be from the India Society's publication in respect of both the letter-press and the illustrations, and I trust that each would serve as a complement to the other. Per-haps I may add that with a view to avoid repetition of references I have not given in this book such references as have been given in the other. Though manuscripts of these two books, in their many forms and at various stages, have been in circulation among scholars since 1925, only one attempt to utilise and yet fore-stall my work has come to my notice: the production being ineffective, even as a summary of my work, I have ignored it altogether. My thanks are due in full measure to a kind friend who has drawn specially for this book, the line-sketches used as illustrations. He prefers to remain anonymous and I greatly regret that I am unable to mention his name. Photographic fidelity has not been aimed at in the sketches, but they possess the all too rare quality of suggestiveness. The exposition of the theme of this book has proceeded on lines which have made it impossible for the illustrations to be inserted in juxta position with the references to them in the letter-press: I regret the divorce between text and illustration, but I am not able to mend it. I am under deep obligation to my friend, Mr. V Narayanan, M.A., M.L., Advocate, Madras, for kindy discussing the subject with me in some of its aspects. I must confess that the conclusions presented in this book must necessarily be tentative till the various sastras, inclusive of the silpa, the agama and the tantra, and the diverse beliefs, practices and customs of the people have been studied with some approach to thoroughness. An humble attempt in that direction will be found in a work, The Evolution of the Temple, which I hope to complete shortly.